Nickelodeon channels across Northern Europe have announced on their official websites and Facebook profile pages the exciting Nickelodeon International news that they will start to premiere and show Nick's brand-new live-action comedy series "The Haunted Hathaways" this weekend (Saturday 30th November 2013 and Sunday 1st December 2013) as part of Nickelodeon Northern Europe's Autumn/Winter 2013 programming highlights! Nickelodeon Denmark (Danmark) - Sunday 1st December 2013 at 7:35pm (17:35); Locally titled "De Hjemsøgte Hathaways"
Nickelodeon Germany (Deutschland) - Saturday 31st November 2013 at 7:10pm (19:10 Uhr); Locally titled "Voll Vergeistert"
Nickelodeon Austria (Österreich) - Saturday 31st November 2013 at 7:10pm (19:10); Locally titled "Voll Vergeistert"
Nickelodeon Switzerland (Schweiz) - Sunday 1st December 2013 at 6:25pm (18:25); Locally titled "Voll Vergeistert"
Nickelodeon Poland (Polska) - Sunday 1st December 2013 at 7:45pm (19:45); Locally titled "Nawiedzeni". Follow NickALive! on Twitter, Tumblr, Google+, via RSS, on Instagram, and/or Facebook for the latest Nickelodeon Northern Europe and The Haunted Hathaways News! Excited to announce that as of tomorrow onwards you will be able to catch our BRAND NEW Christmas song 'I Love Christmas Time' on @NickJrUK. "The Go!Go!Go! Show", launched in 2010, has received outstanding reviews and to date has completed over 100 live performances in London's West End and on tour around Britain. The family musical act features a cast of six: Carl, Gemma, Jade, Holly, Steve, the inquisitive Mr. Baffled and his sidekick, the sock-munching Fluffalope performing a unique and interactive mix of pop music, dance and comedy. For Nick Jr.'s popular series, the live show experience has been translated to create specific content for Nick Jr. to encourage audience interaction and physical movement. With songs incorporating themes such as fitness, friendship and healthy eating, the Go! Go! Go! bespoke interstitial spots feature follow-along dance routines and original music written by UK pop supremos Mike Stock and Steve Crosby. With songs incorporating themes such as fitness, friendship and healthy eating, The Go!Go!Go! Show covers all of the Nick Jr. day parts, changing from lively morning songs to calming before bedtime segments. 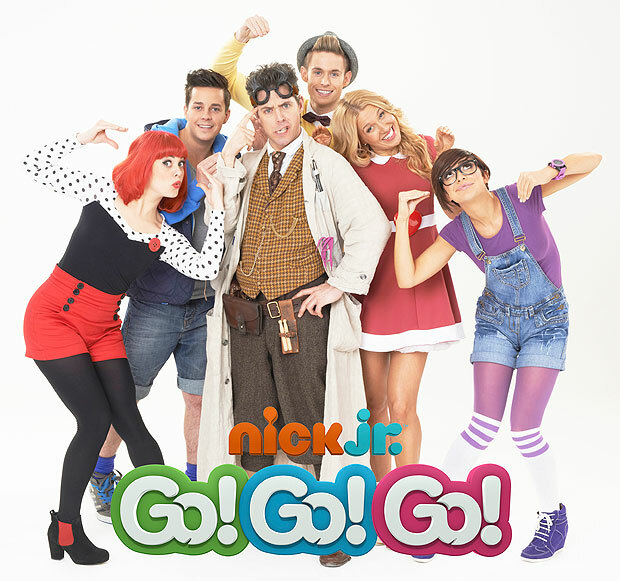 Embedded into the continuity of the Nick Jr. schedule, the Go! Go! Go! spots announces upcoming programming as well as providing a human face for the channel. Follow NickALive! 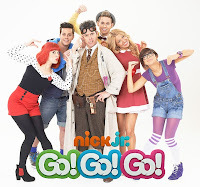 on Twitter, Tumblr, Google+, via RSS, on Instagram, and/or Facebook for the latest Nick Jr. UK and The Go!Go!Go! Show News! 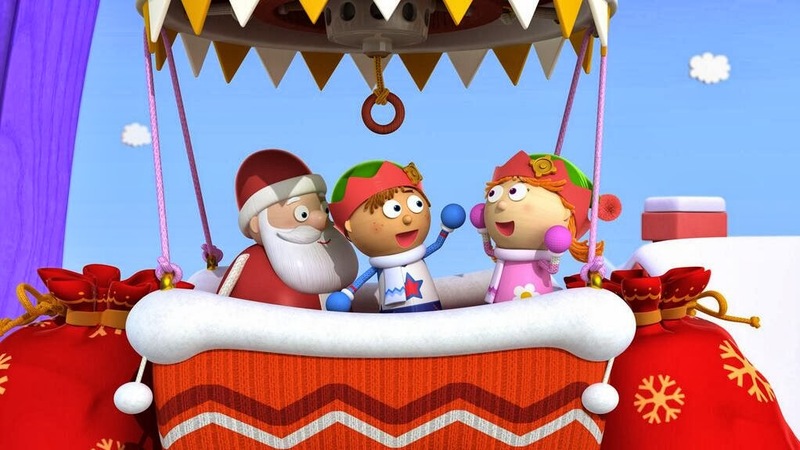 Nick Jr. UK keeps the festive fun going after the debut of the all-new "PAW Patrol" Christmas special with a selection box of Christmas-themed episodes of popular shows, including "Peppa Pig" ("Mr Potato's Christmas Show" and "Peppa's Christmas"), "Ben & Holly's Little Kingdom", and "Tickety Toc" ("Christmas Present Time"), plus the festive "Barbie" movie "Barbie in the Nutcracker"! 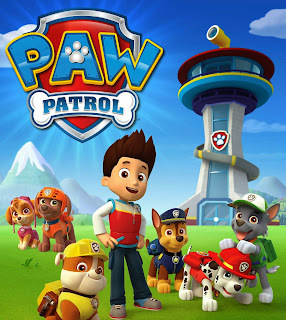 "Paw Patrol" is a hit CGI-animated series that stars a pack of six heroic rescue pups – Chase, Marshall, Rocky, Rubble, Zuma and Skye - who are led by a tech-savvy boy named Ryder. Together they work hard to show the people of Adventure Bay that "no job is too big, no pup is too small!". Follow NickALive! 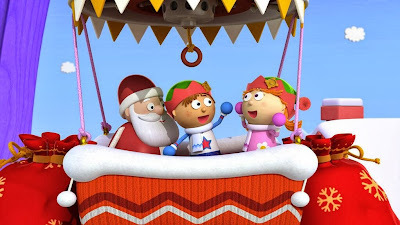 on Twitter, Tumblr, Google+, via RSS, on Instagram, and/or Facebook for the latest Christmas on Nick Jr. UK and Ireland News and Highlights! Nick Jr. UK and "Tickety Toc" UK have announced the Tick Tocktastic news in a series of Tweets (posts) on their official Twitter profile pages, @NickJRUK and that Nickelodeon UK's preschool channel, Nick Jr. UK and Ireland, will premiere and show the brand new Christmas special episode of Nick Juniors' popular animated preschool television series "Tickety Toc", titled "Christmas Present Time", plus brand new episodes of "Ben and Holly's Little Kingdom", this weekend as part of the channels Christmas programming line-up! 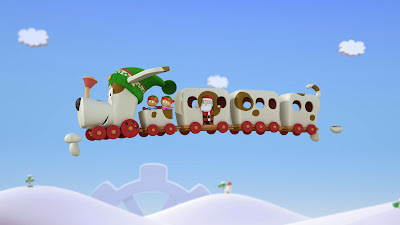 According to the 'What's On' schedule section on nickjr.co.uk, Nick Jr. UK will debut the all-new "Tickety Toc" Christmas special on Saturday 30th November 2013 at 12:25pm (replayed one-hour later at 1.25pm on Nick Junior UK's plus-one timeshift channel, Nick Jr.+1), and air a encore on Sunday 1st December 2013 at 1:35pm (repeated at 2:35pm on Nick Jr+1)! In the brand new "Tickety Toc" special, when Santa Claus crashes over Tickety Town on Christmas eve, everyone helps fix his sleigh and make sure the presents are delivered in time for Christmas - and all before chime time! Following the premiere of the brand new #TicketyChristmas special, the shows official Twitter feed will be hosting a very special VIP after-show Twitter Party, and every Tick Tocketeer is invited! Simply log-on to the shows official Twitter stream at @TicketyTocUK between 1pm and 2pm to join in the Tickety Tocktastic party fun! There'll also be chances to win great "Tickety Toc" toys! 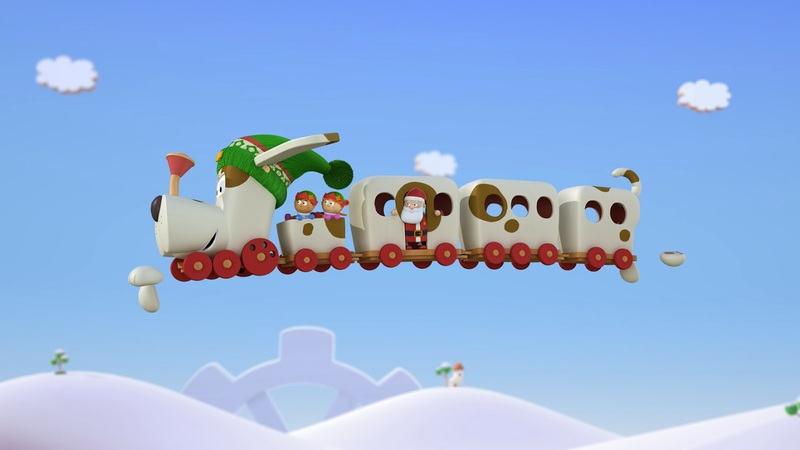 To celebrate Nick Jr. UK showing the brand new Nickmas special of "Tickety Toc", Nick Jr. UK and "Tickety Toc" have posted exclusive sneak peek screenshots/framegrabs from the all-new episode on their official Twitter pages, which you can view below! We've got a weekend packed with Christmas specials lined up for you - guaranteed to keep the kids happy! - Friday 29th November 2013. Tomorrow is our Christmas special & after-show Twitter Party! 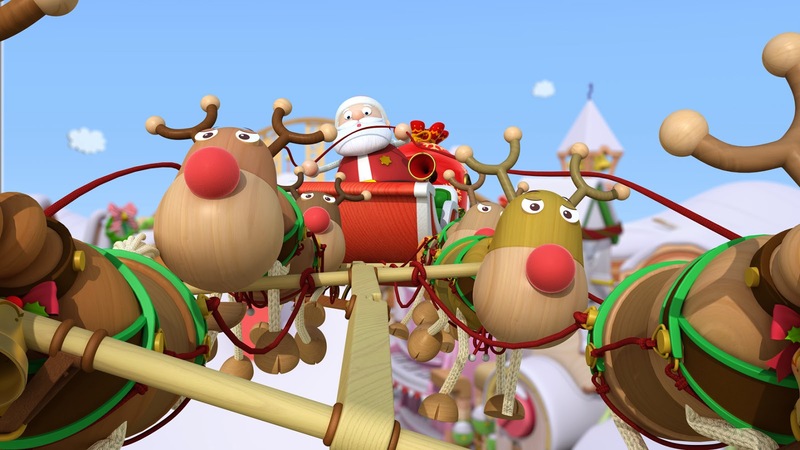 'Christmas Present Time' 12:30pm @NickJRUK Join us on Twitter at 1pm! - 29/11/2013. Moooooooo! Listen up my Tick Tocketeers! 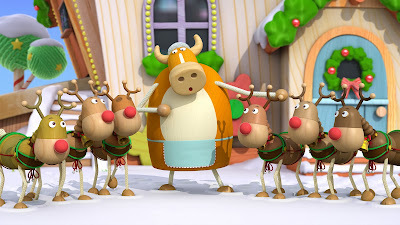 It's the @ticketytocuk Christmas Special on Saturday @NickJRUK 12:30pm - I am the star of the show! - 28/11/2013. To further celebrate the UK premiere of the brand new "Tickety Toc" special, British toy maker Vivid Imaginations has announced a exclusive Twitter competition where British "Tickety Toc" fans can win great one of three fantastic Clockhouse playsets! To enter Vivid's contest, simply send a Tweet to @VividToyGroup and tell them which "Tickety Toc" character you'd invite for Xmas dinner & why! Follow NickALive! on Twitter, Tumblr, Google+, via RSS, on Instagram, and/or Facebook for the latest Nick Jr. UK News and Highlights! Cross your fingers and wish for luck as Nickelodeon UK gets Jinxed! Nickelodeon UK, the number one commercial kids TV network in the UK, has announced in the following Press Release the very exciting Nick UK News that Nickelodeon UK and Ireland and Nickelodeon HD UK will premiere and show the brand new Nickelodeon Original TV Movie "Jinxed" on Friday 6th December 2013 at 7:00pm (replayed at 8:00pm on Nick UK's plus-one timeshift channel, Nick+1), only one week after the film debuts on Nick USA! "Jinxed", a 90-minute comedy, follows the misadventures of Meg Murphy (Ciara Bravo, "Big Time Rush"), a 14-year-old girl whose family has been magically cursed with "Murphy's Law", a spell of never-ending bad luck. While spending the summer at her grandpa's (Jay Brazeau) house, Meg develops a friendship with a local cutie named Brett (Jack Griffo, "The Thundermans"). The possibility of romance probes Meg to discover the way to break the family's "if anything can go wrong, it will" curse. She and her daredevil little brother, Charlie (Jacob Bertrand, "Marvin Marvin"), set off on a hilarious, calamity-filled zany adventure to break the 100-year-old jinx that has caused the Murphys to become the unluckiest family ever and try to turn their family's luck around once and for all, and give Meg the normal life she's always dreamed of living. The movie also features Nickelodeon Star Burkely Duffield, who plays 'Edison Sweet' / 'Eddie Miller' in Nick's hit mystery drama series "House of Anubis", as 'Tommy'. "Jinxed" will also give British and Irish NickHeads a glimpse of actor Jack Griffo before his brand new Nickelodeon sitcom "The Thundermans" premieres on Nick UK and Ireland in 2014! While spending the summer at her grandpa's house, Meg develops a friendship with a local boy named Brett and the possibility of romance probes Meg to break the family's "if anything can go wrong, it will" curse. She and her daredevil little brother, Charlie (Jacob Bertrand, "Marvin Marvin"), set off on a hilarious, calamity-filled adventure to try to turn their family's luck around once and for all and give Meg the normal life she's always dreamed of living. Great news! VuTV launches later today! VuTV, co-owned by interactive TV specialist Strategy & Technology and video streaming operator Simplestream, and run by their joint venture Synapse TV, launched at 12:00pm (midday) GMT on the UK digital terrestrial television (DTT) platform Freeview on channel 238 and enables a range of premium channels from Viacom International Media Networks (VIMN), A+E Networks, and Turner Broadcasting to be watched via their existing Freeview HD Internet-connected TV or box for a monthly subscription of £6.99 (€8.38) – with no long-term contracts. To sign up to the service and start to receive a great selection of premium television channels, all you need is a compatible Freeview HD TV or box connected to an aerial and the Internet. Then, simply visit the official VuTV website at vutv.com to register a account. Once you've registered, you will be given an unique Activation Code and PIN to start to use the service. Then on your telly go to channel 238. Log in, and channel 238 becomes a portal to choose from various channels. Using the up and down buttons on your regular Freeview HD remote control, you'll be able to pick a channel from VuTV's launch line-up, including Nickelodeon, Nicktoons, Nick Jr.! Commenting on the Nick News, Arran Tindall, Senior Vice President (SVP), Commercial and Content Distribution, Viacom International Media Networks, UK, Australia, Russia and Eastern Europe, said that Viacom aimed to make its content and channel brands available on whichever platform its audience wants to access them, "so it's great news that Comedy Central, MTV and Nickelodeon will, for the first time, now be accessible via broadband connected digital terrestrial TV in the UK. The VuTV service is an easy, affordable way for suitable Freeview households to sample some of the very best channels that subscription TV in the UK has to offer." BARB will measure viewing for all VuTV channels, providing broadcasters with an additional platform through which to monetise their content via incremental advertising impacts. VuTV powered by Synapse TV – a joint venture between Simplestream and Strategy & Technology – also offers broadcasters unique granular analytics of their consumers’ viewing behaviour. December 2013 programming highlights on VuTV include "Witches of East End" (Lifetime), "Beauty School Cop Outs" (MTV), "Sam & Cat" (Nickelodeon), "SpongeBob SquarePants" ("SpongeBob's Cracking Christmas"; Nicktoons), "Dora the Explorer" (Nick Jr.), "South Park" (Comedy Central), and "Fred Dinenage – Murder Casebook" (CI). Consumers will also be able to enjoy a wide range of Christmas specials such as "Pawn Stars" (History) and "A Country Christmas Special", starring Dolly Parton (Lifetime) and Christmas films such as "Tom & Jerry: A Nutcracker Tale" (Boomerang), "The Christmas Tree" with "Bananas in Pyjamas" (Cartoonito), "The Christmas Show" from the "Regular Show" (Cartoon Network). Freeview HD TV streaming service VuTV has revealed its launch pricing. For a monthly subscription of £6.99 (€8.38), VuTV gives viewers the opportunity to access a premium range of channels – Comedy Central, MTV, CNN, Lifetime, History, H2, Crime & Investigation Network, Nickelodeon, Nicktoons, Nick Jr., Cartoon Network, Boomerang and Cartoonito via their existing Freeview HD Internet-connected TV or box on Freeview channel 238 – with no long-term contracts. There are now over 20 million Freeview homes, making Freeview the biggest digital TV platform in the UK. VuTV is aimed at the rapidly growing population of Freeview HD Internet-connected homes that currently do not have a pay-TV package. All consumers need is a compatible Freeview HD TV or box connected to an aerial and the Internet; no need for any extra boxes or remote controls. Once subscribers have signed up via vutv.com, they will be provided with their personal Activation Code and PIN for a one-off registration of their Freeview HD TV or box, giving quick and easy access to all VuTV’s channels. With premium content being provided, VuTV is seeking high levels of interoperability and security. Synapse, a joint venture between TV technology specialist Strategy & Technology and bespoke streaming solutions provider Simplestream, is working closely with a broad range of manufacturers to ensure their existing and future Freeview HD products meet the standards required. Samsung is the first major manufacturer to provide full support for VuTV in their Freeview HD products, with others to follow soon. A full list of compatible devices is available at vutv.com/compatibility. David Cutts, Director of VuTV, said the platform had been working with manufacturers from across the industry for some years, both to establish the specification for these TVs and to build the system to use them. “We are now finishing off the process of testing and approving the receivers in the market so we can enable more customers to receive VuTV. This is a continuing process and the list of devices that support VuTV will continue to grow”. December highlights on VuTV include Witches of East End (Lifetime), Beauty School Cop Outs (MTV), Sam & Cat (Nickelodeon), SpongeBob SquarePants (Nicktoons), Dora the Explorer (Nick Jr), South Park (Comedy Central), and Fred Dinenage – Murder Casebook (CI). 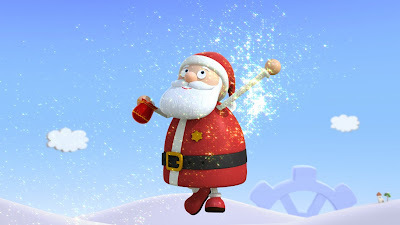 Consumers will also be able to enjoy a wide range of Christmas specials such as Pawn Stars (History) and A Country Christmas Special, starring Dolly Parton (Lifetime) and Christmas films such as Tom & Jerry: A Nutcracker Tale (Boomerang), The Christmas Tree with Bananas in Pyjamas (Cartoonito), The Christmas Show from the Regular Show (Cartoon Network). 'Tis the season to be a finger! Nickelodeon UK, the number one commercial kids TV network in the UK, has announced in the following Press Release the exciting news that Nickelodeon UK has today, Thursday 28th November 2013, released a localised version of the popular Nick App in the UK and Ireland! 'Appy 'Appy Joy Joy! Available for free and featuring over 200 pieces of exclusive Nickelodeon-themed content, the Nick App is available for iPhone, iPad and iPod touch - exclusively on the App Store! Today's launch marks the first availability of the Nick App outside of the US where it launched in February 2013 and amassed five million downloads. The Nick App has also received the prestigious Award for Outstanding Creative Achievement in Interactive Media - User Experience And Visual Design at the 65th Emmy® Awards and has been nominated for the 'Best Streaming Video Platform' award in the 2013 iKids Awards. 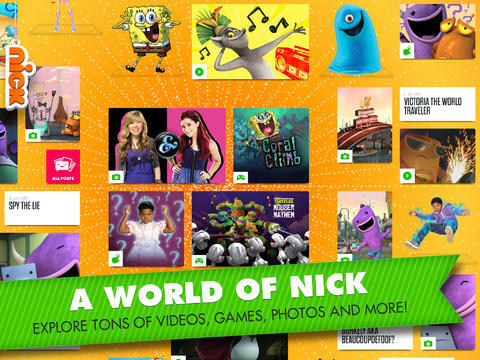 An immersive branded experience, the Nick App will allow British and Irish NickHeads to explore a laughter and slime-filled world that showcases content from hit Nickelodeon and Nicktoons shows such as "Sam & Cat", "The Haunted Hathaways", "SpongeBob SquarePants", "House of Anubis" and "Sanjay and Craig". Kids will be able to interact with the Nick brand through a moveable tile layout that can be swiped in any direction, promoting discovery and exploration and offering fans instant and on-demand access to Nickelodeon content. From launch the App will be a destination for short-form videos, behind-the-scenes clips, and comedic sketches. Photos from Nick stars and animated characters are also available as are specially created polls, blogs and games as well as two full-length Nickelodeon episodes. New content will be added to the Nick App every day. More information on the Nick App can be found at nick.co.uk/app. 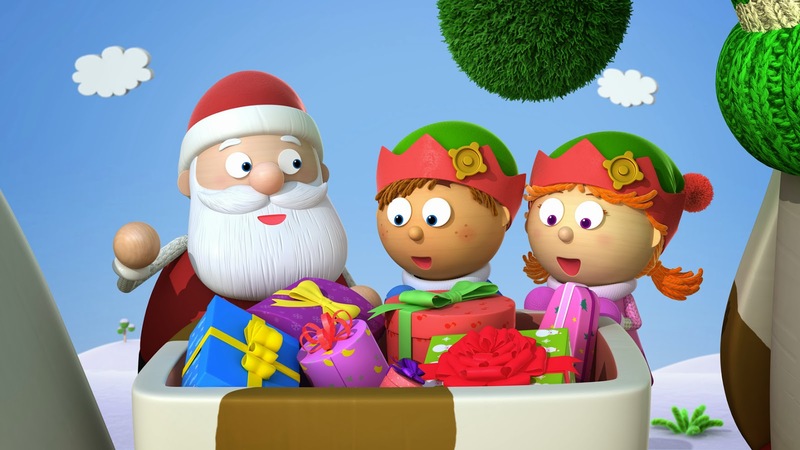 The launch of the Nick App will be supported on Nickelodeon's online and social media channels as well as on air through the 'Appy Christmas competition, where kids will have the chance to win a iPad Mini everyday from Sunday 1st to Tuesday 24th December 2013, making it a very Appy Christmas! Special promotional spots to introduce the app and its content will also be broadcast on air. 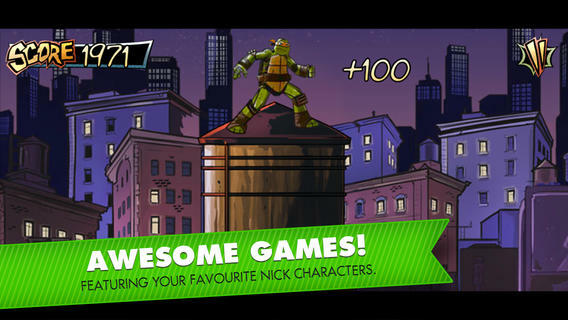 First International Launch for Emmy-Winning App Downloaded 5M Times in U.S.
London, UK – 28th November, 2013 – Available for free and featuring over 200 pieces of Nickelodeon-themed content, the Nick App is available from today for iPhone, iPad and iPod touch - exclusively on the App Store. Today’s launch marks the first availability of the Nick App outside of the US where it launched this February and amassed five million downloads. The Nick App has also received the Award for Outstanding Creative Achievement in Interactive Media - User Experience And Visual Design at the 65th Emmy® Awards. "We know from our research that kids expect to access content wherever they are. 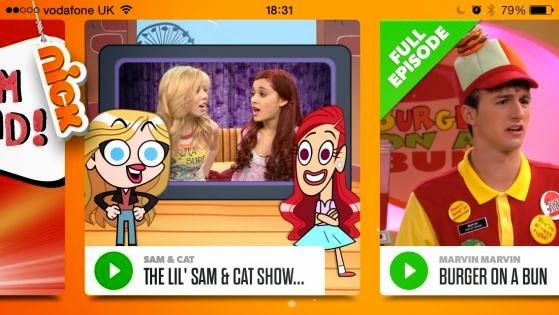 The Nick App, through its layout, navigation and ever-refreshing content is an excellent way to serve our audiences with the Nick content that they want as well as offer a sample to the uninitiated to what Nick has to offer," said Tina McCann SVP, Managing Director, Nickelodeon UK. An immersive branded experience, the Nick App will allow Nickelodeon fans to explore a laughter and slime-filled world that showcases content from hit Nickelodeon and Nicktoons shows such as Sam & Cat, The Haunted Hathaways, SpongeBob SquarePants, House of Anubis and Sanjay and Craig. Kids will be able to interact with the Nick brand through a moveable tile layout that can be swiped in any direction, promoting discovery and exploration and offering fans instant and on-demand access to Nickelodeon content. From launch the App will be a destination for short-form videos, behind-the-scenes clips, and comedic sketches. Photos from Nick stars and animated characters are also available as are specially created polls, blogs and games as well as two full-length Nickelodeon episodes. New content will be added to the Nick App every day. 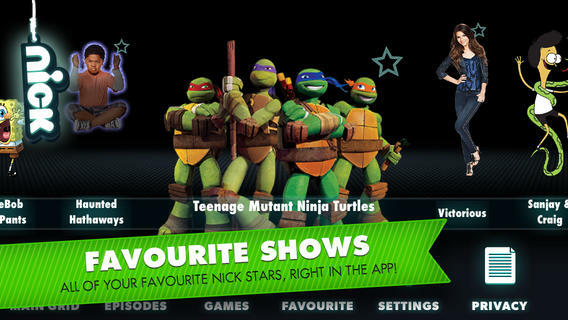 More information on the Nick App can be found at nick.co.uk/app. The launch of the Nick App will be supported on Nickelodeon’s online and social media channels as well as on air through the ‘Appy Christmas competition. Special promotional spots to introduce the app and its content will also be broadcast on air. 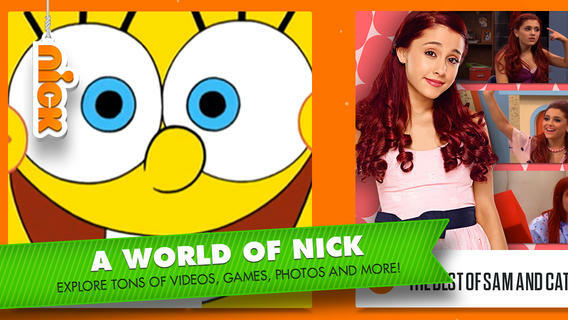 The Nick App is available free from the App Store on iPhone, iPad or iPod touch or here. The Nick app puts the best of Nickelodeon at your fingertips... hilarious original videos, animated shorts, games, full episodes, and more! It's jam-packed with amazing awesomeness. * FUN OVERLOAD: Swipe to explore, zoom in and out, and let your fingers point the way to fun. * LAUGH-OUT-LOUD ORIGINAL VIDEOS: Hungry for funny? Get ready for tons of brand new wild and wacky videos from your favourite Nick characters and stars, like Ariana Grande, Jennette McCurdy, Lucas Cruikshank, Jerry Trainor, and the guys from Big Time Rush. New videos are added all the time! * GAMES: Whether you’re replaying your favourite Nick games, or checking out all new games, prepare to be entertained for hours. Play on! * ANIMATED SHORTS: Watch all-new and rarely-screened animated shorts featuring SpongeBob, Teenage Mutant Ninja Turtles, Fairly Odd Parent and more. * SAVE YOUR FAVOURITES: Got a video or game you want to find again? Just drag it into your favourites folder. That way, you can go back and see it again, whenever! * POLLS: Would you rather have Patrick’s brains or Squidward’s mood? Take these fast and funny polls and cast your vote. See how your pick measures up to other Nick app kids! * SURPRISING SURPRISES: Keep exploring every day to discover new, hilarious surprises from Nick. A word to the wise: look out for SLIME! * DIRECT ACCESS: If you know exactly what you want to do, pull the Nick string on the upper left and switch over to the main menu where you can access characters or categories. * A WORLD OF NICK: The whole Nick gang is waiting for you – Sam & Cat, SpongeBob, Victorious, Teenage Mutant Ninja Turtles, Haunted Hathaways, Sanjay and Craig, iCarly, Monsters vs. Aliens, Fairly Odd Parents, Korra, Robot & Monster, Marvin Marvin, Wendell & Vinnie, Big Time Rush, and more. Download now – let's get APPIN’ already! This app only works with iOS devices running iOS 6.0 and above. Be sure to update your device to the latest operating system. The Nick app collects non-personal aggregated user data. As needed, Nickelodeon and/or a third party may generate an identifier that is unique to the application as downloaded to a specific device, known as the Core Foundation Universally Unique Identifier (CFUUID). User data may be used, for example, to respond to user requests; enable users to take advantage of certain features and services; personalize content and advertising; and manage and improve Nickelodeon’s services. Nick’s collection of user data is in accordance with applicable law, such as COPPA. For more information regarding Nickelodeon’s use of user data, please visit the Nickelodeon Group. The licensing business news website Licensing.biz is reporting the exciting Nick Jr. News in the following article that Zodiak Kids has secured a deal with Signature Publishing to produce the first ever preschool magazine based on Zodiak Kids' hit CG-animated Nick Jr. preschool series "Tickety Toc"! Signature Publishing will launch their brand new "Tickety Toc" magazine during Summer 2014. Featuring stories, games, colouring in activities and posters, the new title will retail in shops around the UK at £3.25. The "Tickety Toc" magazine will also be available in digital format, retailing at £1.99. As well as a stand alone magazine, "Tickety Toc" will also feature in Signature Publishing's compilation magazines, Fantastic Funworld and Rainbow Fun. Filled with 'instant makes', art projects and ideas alongside a free art kit, the Mister Maker magazine will be produced by Immediate Media and will hit shelves from June 2014, retailing at £3.50. The Tickety Toc magazine will also be available in digital format, retailing at £1.99 as well as featuring in Signature Publishing's compilation magazine, Fantastic Funworld and Rainbow Fun. Signature Publishing's editor in chief, Amanda Clifford, concluded: "Tickety Toc is one of the most exciting pre-school brands around so we are delighted to be working with Zodiak Rights on the stand alone magazine. "Tickety Toc is a fantastic pre-school property and has a unique appeal to boys and girls. It's a brand that's full of charm and fun and we can't wait to publish the stand alone magazine and incorporate it into our other existing pre-school magazines Fantastic Funworld and Rainbow Fun." Follow NickALive! on Twitter, Tumblr, Google+, via RSS, on Instagram, and/or Facebook for the latest Nick Jr. UK and Tickety Toc News! In Space, no one can hear the Monkey Carols... Oh, wait, they can! Nickelodeon UK, the number one commercial kids TV network in the UK, has announced in their brand new trailer the very exciting Nick UK News that, to celebrate the Christmas season, Nick UK's animation and action channel, Nicktoons UK and Ireland, will premiere and show the brand new Christmas special episode of the Canadian animated comedy series "Rocket Monkeys", titled "The Peel Who Stole Christmas", in which the Monkey brothers, Gus and Wally go tinsel, on Sunday 1st December 2013 at 9:30am, as part of NickToons UK's "SpongeBob's Cracking Christmas" programming highlights! "I am NOT a Banana, I am SANTA!" 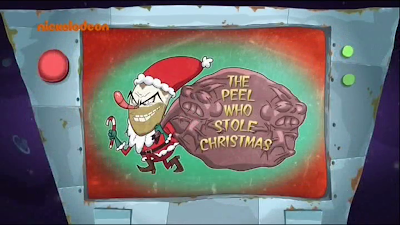 Rocket Monkeys: The Peel Who Stole Christmas episode title card from the Rocket Monkeys wiki. Follow NickALive! on Twitter, Tumblr, Google+, via RSS, on Instagram, and/or Facebook for the latest Christmas Nickelodeon UK and Nicktoons UK News and Highlights! 'Tis the season to be a SpongeBob SuperFan! Nickelodeon UK, the number one commercial kids TV network in the UK, has announced in their brand new trailer the very exciting Nick UK News that, to celebrate the Christmas season, Nick UK's animation and action channel, Nicktoons UK and Ireland, will be hosting a brand new and exclusive "SpongeBob SquarePants"-themed 'Watch and Win' competition called "SpongeBob's Cracking Christmas", where NickToons will be giving British and Irish SpongeBob fans the chance to win Sponge-Tastic SpongeBob prizes! Throughout December, Nickelodeon megastar SpongeBob SquarePants and his friends will be trying to make you crack the biggest festive giggle by telling festive jokes! To be in with the chance to win amazing SpongeBob prizes, simply keep your eyes peeled to which Bikini Bottom dweller is cracking that days daily joke. Once you've spotted which SpongeBob character is delivering that days Christmas Cracker, head to the contests' official website at nicktoons.co.uk/spongebob and tell NickToons who you saw telling that days joke, and you could be winning great SpongeBob prizes, including a SpongeBob Scooter, a SpongeBob SquarePants Pineapple House Playset, a SpongeBob SquarePants Pirate Ship, a SpongeBob SquarePants Pineapple Ukulele Outfit, a copy of the latest SpongeBob SquarePants video game, Plankton's Robotic Revenge, and a superb family holiday on board a Norwegian Cruise Line ship! Plus, NickToons will be premiering and showing brand new Christmas specials of the popular animated series "Robot and Monster" ("Baconmas") and "Rocket Monkeys" ("The Peel Who Stole Christmas")! "SpongeBob's Cracking Christmas", all this December, only on NickToons! * Competition prizes supplied by Argos and Norwegian Cruise Line. Nickelodeon has today, Tuesday 26th November 2013, announced in the following press release, from PRNewswire, the exciting news that Nickelodeon, the number-one entertainment brand for kids and families, and Amazon.com, the world's largest online retailer, will celebrate the holiday shopping season with the launch of three Nick-themed boutiques inspired by Latina heroine, "Dora the Explorer"; pop culture phenomenon, "SpongeBob SquarePants"; and the crime-fighting heroes in a half shell, "Teenage Mutant Ninja Turtles"! Kicking off today, each Nickelodeon-themed holiday boutique will feature more than 100 discounted products, with savings up to 50% off, ranging from $5.99 - $380.00. Products available for purchase span across the following categories: jewelry, electronics, toys, video games, furniture, home decor, CDs and DVDs, bedding and collectibles, including vinyl figures. Additionally, NickHeads will be able to download one episode of each Nickelodeon series featured in the promotion for free through to Monday 2nd December 2013! NEW YORK, Nov. 26, 2013 /PRNewswire/ -- Nickelodeon and Amazon.com celebrate the holiday shopping season with the launch of three Nick-themed boutiques inspired by Latina heroine, Dora the Explorer; pop culture phenomenon, SpongeBob SquarePants; and the crime-fighting heroes in a half shell, Teenage Mutant Ninja Turtles. Kicking off today, each holiday boutique will feature more than 100 discounted products, with savings up to 50% off, ranging from $5.99 - $380.00. Products available for purchase span across the following categories: jewelry, electronics, toys, video games, furniture, home decor, CDs and DVDs, bedding and collectibles, including vinyl figures. "Amazon is a trailblazer in the E-Commerce industry and we are thrilled to continue to work with them to develop innovative programs like the Nick Holiday Boutiques for our fans," said Dion Vlachos, Senior Vice President, Retail Sales and Marketing, Nickelodeon Group. "Through this program we're enabling shoppers to prepare for the busy gift giving season, offering an easy and streamlined way to purchase Nickelodeon goodies for everyone on their list." Additionally, fans will be able to download one episode of each of the series for free through 12/2. Amazon and its affiliates operate websites, including www.amazon.com [USA], www.amazon.co.uk [UK], www.amazon.de [Germany (Deutschland)], www.amazon.co.jp [Japan], www.amazon.fr [France], www.amazon.ca [Canada], www.amazon.cn [China], www.amazon.it [Italy (Italia)], www.amazon.es [Spain (Espana)], www.amazon.com.br [Brazil (Brasil)], www.amazon.in [India], and www.amazon.com.mx [Mexico]. As used herein, "Amazon.com," "we," "our" and similar terms include Amazon.com, Inc., and its subsidiaries, unless the context indicates otherwise. Follow NickALive! on Twitter, Tumblr, Google+, via RSS, on Instagram, and/or Facebook for the latest Nickelodeon Consumer Products (NCP) News! The Toy Industry Association (TIA) of North America has announced the exciting Nickelodeon News in the following press release, from PRNewswire, that Nickelodeon's "Teenage Mutant Ninja Turtles" has been nominated for Property of the Year in the prestigious 2014 Toy of the Year Awards (TOTY)! The annual awards program is sponsored by the toy industry itself to recognize the top toys available across 12 categories -- from e-Connected and Activity to Educational and Outdoor toys. Because the finalists have been nominated from within the industry and winners are selected by a combined vote of toy manufacturers, retailers, media and consumers, the TOTY Awards are known as the "Oscars" of the industry. The 'Property of the Year' category celebrates the property that had the greatest success spreading its brand throughout the industry during the past year. The 2014 finalists -- representing 68 unique products or properties from 41 companies -- were selected from more than 520 nominees submitted for consideration by 153 companies. Sixty academics, journalists, toy trend experts, play therapists, toy inventors and designers, and toy retailers staffed the nomination committees that narrowed the field to the slate of finalists. Beginning today, Monday 25th November 2013, through to Monday 13th January 2014, toy lovers of all ages can visit ToyAwards.org to vote for their favorite playthings. Each vote is a chance to win one of twelve TOTY prize packages filled with the toys and games featured in each category. Four additional ballots -- for mass retailers, specialty toy retailers, media, and TIA members -- were also launched today and will remain open through January 13, 2014. All five ballots will be weighted and used to determine each of the category winners. The overall "Toy of the Year" award will be selected based on votes received from journalists and bloggers, retailers and TIA members; the "People's Choice Award" will be selected based on votes solely from consumers on ToyAwards.org. Congratulations and good luck, Nickelodeon!! NEW YORK, Nov. 25, 2013 /PRNewswire/ -- The Toy Industry Association (TIA) announced today the 84 toy, game and property finalists for the prestigious 2014 Toy of the Year Awards (TOTY). The annual awards program is sponsored by the toy industry itself to recognize the top toys available across 12 categories -- from e-Connected and Activity to Educational and Outdoor toys. Because the finalists have been nominated from within the industry and winners are selected by a combined vote of toy manufacturers, retailers, media and consumers, the TOTY Awards are known as the "Oscars" of the industry. "This year's TOTY finalists embody the innovative spirit of the toy industry and transport children to magical worlds through play," said Carter Keithley, TIA President. "The TOTY Awards program also supports the philanthropic work of the Toy Industry Foundation, which partners with generous toy companies to bring brand new toys to deserving kids throughout the year." Beginning today through January 13, 2014, toy lovers of all ages can visit ToyAwards.org to vote for their favorite playthings. Each vote is a chance to win one of twelve TOTY prize packages filled with the toys and games featured in each category. The winners will be announced during an awards ceremony held on Saturday, February 15, 2014 as the kick-off to the 111th American International Toy Fair. * Hot Wheels® Car Maker by Mattel, Inc.
* PLAY-DOH PERFECT TWIST ICE CREAM Playset by Hasbro, Inc.
* Skylanders SWAP Force™ by Activision Publishing, Inc..
* TRANSFORMERS™ CONSTRUCT-BOTS by Hasbro, Inc.
* Skylanders SWAP Force™ by Activision Publishing, Inc.
* Barbie® Digital Makeover by Mattel, Inc.
* LeapPad Ultra™ by LeapFrog Enterprises, Inc.
* GoldieBlox™ and the Spinning Machine by GoldieBlox™ Inc.
* LeapReader™ by LeapFrog Enterprises, Inc.
(does not include video games or apps). * DRAW SOMETHING™ PARTY Game by Hasbro Inc.
* FURREAL FRIENDS CUDDLES, MY GIGGLY MONKEY by Hasbro, Inc.
* NERF REBELLE HEARTBREAKER Bow by Hasbro Inc.
* Farm Mash-Up by LeapFrog Enterprises, Inc.
* FURREAL FRIENDS CUDDLES, MY GIGGLY MONKEY by Hasbro Inc.
* Bunny Peek A Boo™ by Smart Toys and Games, Inc.
TIA is the not-for-profit trade association representing all businesses involved in creating and bringing toys and youth entertainment products to kids of all ages, representing more than 600 companies who account for approximately 85% of domestic toy sales. Toy safety is the number one priority for the toy industry. TIA has a long history of leadership in toy safety including the development of the first comprehensive toy safety standard more than 30 years ago, and working with government, consumers and industry on ongoing programs to ensure safe and fun play. For more information, please visit www.toyassociation.org or www.toyinfo.org. After Frodo and Bilbo, there was Bubble! Nickelodeon, the number-one entertainment brand for kids and families, has announced in the following press release, from TV By The Numbers, the exciting Nickelodeon News that, in advance of the US theatrical release of the brand new movie "The Hobbit: The Desolation of Smaug" on Thursday 12th December 2013, Nick USA will premiere and show the brand new epic "Bubble Guppies" primetime special "The Puppy and the Ring" - the must-see movie of this holiday season that will feature magical creatures, wondrous realms, and one "precious" puppy - on Thursday 5th December 2013, 7-8 p.m. (ET/PT)! Inspired by "The Lord of the Rings", the mythical adventure features Jeffrey Tambor ("Arrested Development") as the voice of an evil Night Wizard who has stolen the Ring of the Sun. The Emmy Award-winning preschool series "Bubble Guppies" is currently the number-one rated preschool show in its time period (11am-12pm). 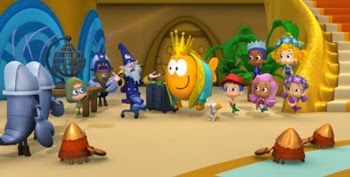 In the all-new "Bubble Guppies" primetime special "The Puppy and the Ring", preschoolers are welcomed into Bubbledom, a land of secrets and sorcery where the magical Ring of the Sun has always kept night and day in perfect balance. But when the evil Night Wizard takes the Ring from the benevolent Sun King, Bubbledom could be thrown into darkness forever! Join Molly and Gil as they accompany their puppy on a quest through three magical realms so they can return the Ring of the Sun to its rightful owner by sundown. 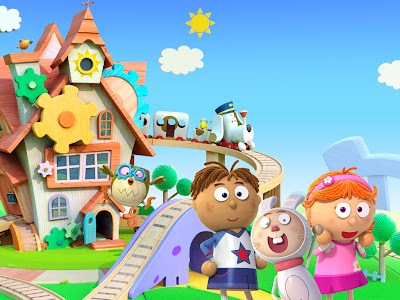 At NickJr.com, Nickelodeon's award-winning website for parents and preschoolers, fans can experience "Bubble Guppies"'s online transformation into the world of Bubbledom; watch a online streaming video featuring a sneak-peek of "The Puppy and the Ring" and print exclusive "Bubble Guppies" games and activities. Additionally, the special will be available for download beginning Friday 6th December 2013 on iTunes, Amazon, Xbox, Playstation, Vudu, Target Ticket, Samsung and VDIO. AFTER FRODO AND BILBO, THERE WAS BUBBLE! NEW YORK – NOV. 25, 2013 – The must-see movie of this holiday season features magical creatures, wondrous realms, and one “precious” puppy. In advance of The Hobbit: The Desolation of Smaug release (Dec. 12), Nickelodeon will debut the epic Bubble Guppies primetime special, “The Puppy and the Ring,” premiering Thursday, Dec. 5, 7-8 p.m. (ET/PT). Inspired by The Lord of the Rings, the mythical adventure features Jeffrey Tambor (Arrested Development) as the voice of an evil Night Wizard who has stolen the Ring of the Sun. The Emmy Award-winning series Bubble Guppies is currently the number-one rated preschool show in its time period (11a-12pm). "I am going to be a hero in my own household," says Tambor. "My twin boys will go ballistic when they hear Daddy. Ah to be 'cool' in one's own living room." In “The Puppy and the Ring,” preschoolers are welcomed into Bubbledom, a land of secrets and sorcery where the magical Ring of the Sun has always kept night and day in perfect balance. But when the evil Night Wizard takes the Ring from the benevolent Sun King, Bubbledom could be thrown into darkness forever! Join Molly and Gil as they accompany their puppy on a quest through three magical realms so they can return the Ring of the Sun to its rightful owner by sundown. At NickJr.com, Nickelodeon's award-winning website for parents and preschoolers, fans can experience Bubble Guppies online transformation into the world of Bubbledom; watch a sneak-peek of “The Puppy and the Ring” and print Bubble Guppies games and activities. Additionally, the special will be available for download beginning Dec. 6 on iTunes, Amazon, Xbox, Playstation, Vudu, Target Ticket, Samsung and VDIO. Bubble Guppies is created and executive-produced by Jonny Belt and Robert Scull and co-developed by Janice Burgess, the Emmy Award-winning team behind the hit Nickelodeon series' The Backyardigans and Little Bill. The CG-animated series set in a vibrant underwater environment follows a group of diverse preschoolers with colorful fish tails who go on adventures discovering their world. 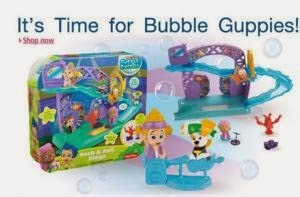 Bubble Guppies is set to a soundtrack of catchy, educational pop songs and features a curriculum that infuses the core elements of kindergarten readiness including: math, literacy, the arts, science and socio-emotional development. Follow NickALive! on Twitter, Tumblr, Google+, via RSS, on Instagram, and/or Facebook for the latest Nickelodeon and Bubble Guppies News and Highlights! The broadband media industry news website Advanced Television is reporting the very exciting Nickelodeon UK News in the following article that VuTV, the brand new Internet Protocol Television (IPTV) service which will make a range of pay-TV channels, including Nickelodeon UK, Nicktoons UK, Nick Jr. UK, Comedy Central, and MTV available to homes with Freeview HD, is scheduling to launch later this week (week beginning Monday 25th November 2013)! VuTV, co-owned by interactive TV specialist Strategy & Technology and video streaming operator Simplestream, and run by their joint venture Synapse TV, will launch on the UK digital terrestrial television (DTT) platform Freeview on channel 238 and will enable a range of premium channels from Viacom International Media Networks (VIMN), A+E Networks, and Turner Broadcasting to be watched via Freeview HD boxes, through pay-as-you-go monthly payments. Prior to its consumer launch later this week, executives behind TV streaming service VuTV have revealed further details of the operation’s positioning and strategy. Speaking exclusively to advanced-television.com, Mike Alexander, Business Development Manager at Strategy & Technology (S&T), confirmed that the service would be available on Channel 238 on UK DTT Platform Freeview and deliver linear channels over-the-top to Freeview HD boxes. A+E Networks, Viacom International Media Networks and Turner Broadcasting are the first major broadcasters to sign up to VuTV, featuring channels such as Lifetime, Comedy Central, MTV, CNN, History, H2, Crime & Investigation Network, Nickelodeon, Nicktoons, Nick Jr., Cartoon Network, Boomerang and Cartoonito. “We believe it will be a great value proposition with the channels we have at launch and we have more channels we plan to add in 2014,” he said, adding that by using consumers’ existing Freeview HD boxes, no extra boxes, remotes or power supplies were required. The service is powered by Synapse, a joint venture between Strategy & Technology and bespoke streaming solutions provider Simplestream, and leverages their respective technology and expertise to provide a comprehensive and fully-integrated solution for OTT delivery of linear and on-demand services to a range of connected platforms. “We worry about all the technology, and if someone has content that they want to get onto one of these platforms, they can give us access to that content, and we can do everything else that is needed to be done to deliver that to consumers,” explained Alexander. Noting Freeview research that suggests there are some 7.6 million Freeview HD TVs and boxes in the marketplace which have some form of Internet connectivity, Alexander estimated that there are currently between 0.7 and 1.5 million compatible and connected receivers, with that number set to grow rapidly in 2014. Alexander said that VuTV is targeting a rapidly-growing population of Freeview HD Internet-connected homes that don’t currently have a pay-TV package, suggesting that that there are lots of people out there that would like premium TV, but are not willing to pay the levels of monthly subscriptions required by existing platforms. For channels, Alexander suggested that VuTV was a very cost-effective way to reach the large audience of Freeview consumers compared to using a traditional over-the-air channel which could cost millions. While this week’s launch will confirm pricing points, VuTV plans more of a consumer push in 2014, when further channels are set to be added to the service. Follow NickALive! on Twitter, Tumblr, Google+, via RSS, on Instagram, and/or Facebook for the latest Nickelodeon UK and Ireland News! Nickelodeon, the number-one entertainment brand for kids and families, and Amazon.com, the world's largest online retailer, have announced in the following press release, from Broadway World's TV World, the exciting news that, just in time for the holidays, Nickelodeon and Amazon.com will ignite the holiday shopping season with the launch of "Nickelodeon Day of Deals" on Tuesday 26th November 2013 at www.amazon.com/nickelodeon, where, for one day only, a online extravaganza will treat customers to a full day of lightning deals on their favorite Nickelodeon products across numerous categories including toys, board games, home goods, apparel and more. Fans and holiday shoppers everywhere will be able to enjoy deals up to 40% off, until supplies last! Just in time for the holidays, Nickelodeon and Amazon.Com ignite the holiday shopping season with the launch of "Nickelodeon Day of Deals" on Tuesday, November 26, at www.amazon.com/nickelodeon, for one day only. The online extravaganza treats customers to a full day of lightning deals on their favorite Nickelodeon products across numerous categories including toys, board games, home goods, apparel and more. Fans and holiday shoppers everywhere can enjoy deals up to 40% off, until supplies last. Nickelodeon, now in its 34th year, is the number-one entertainment brand for kids. It has built a diverse, global business by putting kids first in everything it does. The company includes television programming and production in the United States and around the world, plus consumer products, online, recreation, books and feature films. Nickelodeon's U.S. television network is seen in more than 100 million households and has been the number-one-rated basic cable network for 18 consecutive years. Nickelodeon and all related titles, characters and logos are trademarks of Viacom Inc. (NASDAQ: VIA, VIA.B). Nickelodeon and all related titles, characters and logos are trademarks of Viacom Inc. (NASDAQ: VIA, VIA.B). Amazon.com, Inc. (NASDAQ:AMZN), a Fortune 500 company based in Seattle, opened on the World Wide Web in July 1995 and today offers Earth's Biggest Selection. Amazon.com, Inc. seeks to be Earth's most customer-centric company, where customers can find and discover anything they might want to buy online, and endeavors to offer its customers the lowest possible prices. Amazon.Com and other sellers offer millions of unique new, refurbished and used items in categories such as Books; Movies, Music & Games; Digital Downloads; Electronics & Computers; Home & Garden; Toys, Kids & Baby; Grocery; Apparel, Shoes & Jewelry; Health & Beauty; Sports & Outdoors; and Tools, Auto & Industrial. Amazon Web Services provides Amazon's developer customers with access to in-the-cloud infrastructure services based on Amazon's own back-end technology platform, which developers can use to enable virtually any type of business. Kindle Paperwhite is the world's best-selling and most advanced e-reader. It features new display technology with higher contrast, the next generation built-in light, a faster processor, the latest touch technology, and exclusive new features designed from the ground up for readers. Kindle, the lightest and smallest Kindle, features improved fonts and faster page turns. The new Kindle Fire HDX features a stunning exclusive 7" or 8.9" HDX display, a quad-core 2.2 GHz processor, 2x more memory, and 11 hours of battery life, as well as exclusive new features of Fire OS 3.0 including X-Ray for Music, Second Screen, Prime Instant Video downloads, and the revolutionary new Mayday button. The all-new Kindle Fire HD includes an HD display, high-performance processor and dual speakers at a breakthrough price. Amazon and its affiliates operate websites, including www.amazon.com, www.amazon.co.uk, www.amazon.de, www.amazon.co.jp, www.amazon.fr, www.amazon.ca, www.amazon.cn, www.amazon.it, www.amazon.es, www.amazon.com.br, www.amazon.in, and www.amazon.com.mx. As used herein, "Amazon.com," "we," "our" and similar terms include Amazon.com, Inc., and its subsidiaries, unless the context indicates otherwise.